Hublot imparts its interpretation on this life affirming celebration with the Hublot Big Bang One Click Calavera Catrina, the most carefree piece from the skull series. The Hublot Big Bang One Click Calavera Catrina brings to mind delicious as sweets and colourful flower petals in an ode to life. Bringing to life the traditional face-paint of the ‘calaveras’ and the sophisticated make up worn by the ‘Catrinas’ (Elegant Skull) during the celebrations the timepieces showcased a lacquered dial in black or white, engraved with coloured lacquer. The colourful and elegant dresses are conveyed through the straps with stitched multi-coloured skulls and the bezel covered in a 42 sapphire rainbow. There are three limited editions in total: a steel version featuring a white lacquered dial with a matching white leather and rubber strap (100x pieces), a ceramic version (100x pieces) and a King Gold version (50x pieces) both with matching black lacquer dials and black leather straps. The One Click interchangeable strap system allows the Big Bang One Click Calavera Catrina to be transformed instantly and worn with blue or pink leather straps. The timepiece features the HUB1710 self-winding mechanical movement with a 50-hour power reserve. 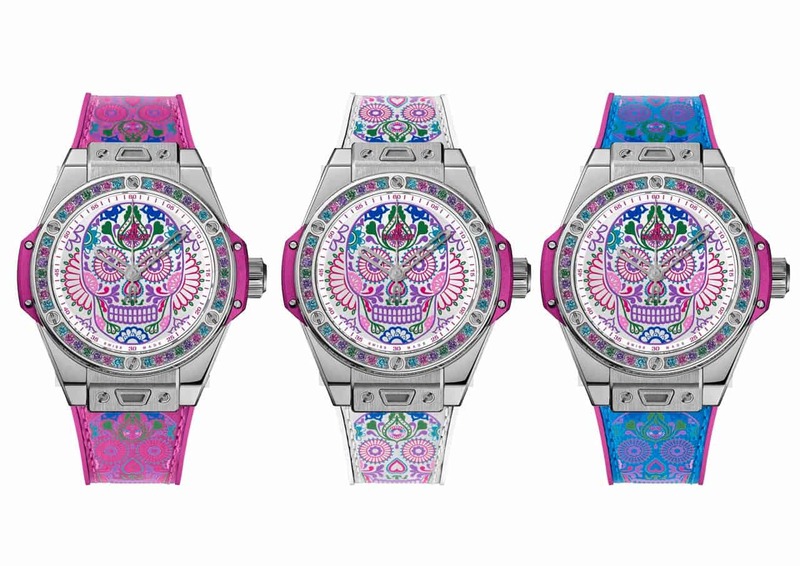 The result is a sophisticated Hublot Sugar Skull tattooed onto the wrist.